Hello fellow music video lovers, it’s Andy Gesner and the HIP Video Promo staff bringing you a true gem of a video. When you’ve got legendary filmmaker David Lynch touting you around as his musical protégé, you’ve without a doubt done something right. 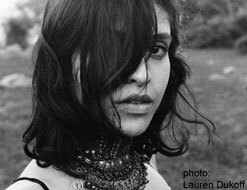 It was Ariana Delawari’s sheer talent and ability to express the stories close to her heart about the heartache of the Afghan people that initially reeled in Lynch as a fan. In her video for “We Came Home,” Ariana Delawari gives us just a taste of the kind of attention her intellectually-stimulating music demands. Ariana Delawari’s vocals are simply unmatched, and her motivation for doing what she does is completely admirable. Her decision to dive head first into music started three years ago after getting a call from her mom that the Taliban was starting to gain power again (her parents had returned to Afghanistan in 2002 as a part of a rebuilding effort and Ariana herself had been travelling there frequently herself). She immediately collaborated with some of the most talented Afghan musicians who, under previous Taliban rule, would have been banned from even pursuing their art and actually recorded a good portion of the new album Lion Of Panjshir in the capital city Kabul while under the protection of armed guards! It’s no wonder why Ariana Delawari is so passionate about addressing the topic of identity while treading the line of Afghan and Western styles of music. You can find “We Came Home” on the debut album, Lion Of Panjshir. Critics at NPR have already embraced it, saying “The Taliban which believes that music is sinister has nevertheless inspired the haunting and powerful sound of Ariana Delawari”.LA Weekly noted her “Haunting Afghan lyrics suddenly morph into English, translated through Delawari’s vulnerable, girlish yet powerful voice; she embodies the raucous rants of Janis Joplin and the modest feistiness of Cat Power … The compositions have the power to drop your heart in a chord change.” You’ll find that even Lynch had to be a part of this album, mixing it himself. “It’s ancient and modern, and it gives a whole other picture to Afghanistan,” Lynch has once said about Ariana Delawari’s music. We can’t help but agree with Lynch’s sentiments and know you’ll feel the same way once you give Ariana Delawari and her video for “We Came Home” a try. We’re very excited to be working Ariana to bring you this stunning new clip. We’re here to hook you up with anything you may need, including copies of Lion Of Panjshir, so don’t hesitate to drop us a line. If you need more info about Ariana Delawari, call Andy Gesner at 732-613-1779 or e-mail us at HIPVideo@aol.com. You can also visit www.ArianaDelawari.com to find out more about Ariana Delawari.